With more and more chefs achieving celebrity status, interest in the exciting world of today's leading chefs is higher than ever. Essential reading for anyone who loves food, Becoming a Chef gives an entertaining and informative insider's look at this dynamic profession, going behind the scenes to look into some of the most celebrated restaurant kitchens across the nation. More than 60 leading chefs--including some of the newest up-and-coming--discuss the inspiration, effort, and quirks of fate that turned would-be painters, anthropologists, and football players into culinary artists. 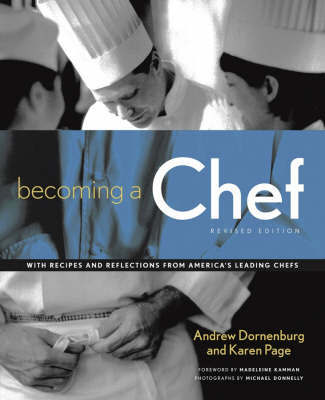 Andrew Dornenburg and Karen Page (both of New York, NY) are the authors of the bestselling titles Culinary Artistry, Dining Out, Chef's Night Out. Dornenburg has cooked professionally at Arcadia, Judson Grill, and March in New York City and Biba and the East Coast Grill in Boston. Page, the recipient of the 1997 Melitta Bentz Award for Women's Achievement, is a graduate of the Harvard Business School.